Magmula nang maging surprise blockbuster hit ang pelikulang Diary Ng Panget), wala nang naging pahinga ang isa sa mga bida rito na si James Reid. Dati raw ay maraming bakanteng araw si James, pero mula nang ipalabas ang kanyang launching movie, halos linggu-linggo ay may pinupuntahan siyang iba’t ibang lugar para mag-perform kasama ang co-stars niyang sina Nadine Lustre, Yassi Pressman, at Andre Paras. Mas magiging busy pa raw si James sa mga susunod na araw dahil naghahanda na sila para sa Diary Ng Panget: Live In Concert sa Skydome ng SM City North EDSA, sa July 11. Susundan ito ng isa pang concert sa Waterfront Cebu City Hotel and Casino sa July 18. Kuwento ni James, “Yeah, we’ll be having two concerts this month. One here in Metro Manila and one in Cebu. “We have a big fan base in Cebu so we’re excited to be there to perform for our fans. “This is our way of thanking the many people who supported our movie. "It’s pretty overwhelming because many are still talking about it and telling us how much they love the movie. “We don’t forget to thank our fans on Twitter, Instagram, and Facebook. "Maraming salamat sa inyo and hope you get to watch our two concerts." 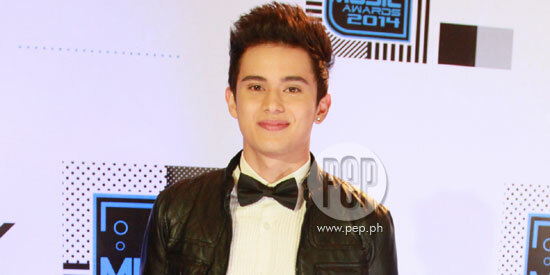 Nakausap ng PEP.ph (Philippine Entertainment Portal) si James sa programang Anong Ganap? ng Viva TV. PREPARATIONS. First time na makakasama si James sa isang malaking concert kaya naman daw puspusan ang kanyang pagre-rehearse kasama ang cast ng Diary Ng Panget. Saad niya, “I love singing and performing in front of many people, but this is something different. "It’s bigger and the people are going to expect a really good show. “Nadine and I will be singing our duet ‘No Erase’ because the fans love singing it with us. “I will also be singing songs from my self-titled album under Viva Records. "I have a fast song titled ‘Natataranta.’ The music video has been playing non-stop over at MTV Pinoy. “We also have dance numbers that the fans will love. THANKFUL. Dahil sa newfound fame ni James, naging in-demand na siyang mag-perform sa company parties at nagkaroon pa siya ng malalaking endorsements. Malaki ang pasasalamat ni James sa loveteam nila ni Nadine na siyang dahilan ng tinatamasa niyang blessings ngayon. “I never thought that something like this would ever happen to me. “But things got better and now the blessings are coming in. “If not for the JaDine team-up, none of this would have happened. “That’s why we’re making it work. We’re a lot closer now than before. "And we are looking forward for our next project." FOLLOW-UP FLICK. Magtatambal ulit sina James at Nadine sa pelikulang Talk Back and You’re Dead na hango sa isang best-selling novel ni Alesana Marie. Pagkatapos ng kanilang dalawang concerts ay sasabak na sila sa shooting ng pelikula. “It’s another great character for me to portray. "If people loved Cross Sanders in Diary Ng Panget, they will also love Top in Talk Back and You’re Dead. “It’s about a good girl named Sam who went head over heels with a gang leader. “The situations in the story are very funny and there will also be kilig moments. "Our director Andoy Ranay will be the one who will create that for our characters," sabi ni James. SHIRTLESS? Sa Diary Ng Panget ay ilang beses nagtanggal ng kanyang shirt si James, kaya siguradong maraming mag-aabang kung gagawin din niya ito sa Talk Back and You’re Dead. “When we were doing Diary Ng Panget, we thought of me doing some shirtless scenes for fun. It turned out to be the most awaited scenes in the movie! “If ever there are such scenes, I’m always ready naman.